Valencia CF: Andres Palop back to Valencia CF? Andres Palop back to Valencia CF? Andres Palop to return to Valencia CF? 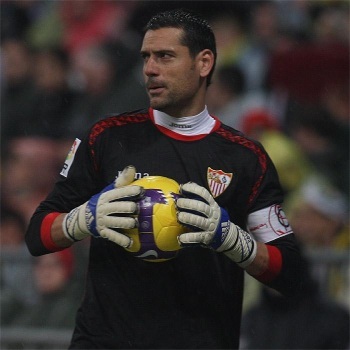 Sevilla FC goalkeeper Andres Palop could return in the summer to Valencia CF. As you know Andres Palop is a Valencia CF product, though found himself as a second goalkeeper most of the time due to the fact it was in the time when Santiago Cañizares was Valencia's first goalkeeper. The 39 years old goalkeeper has basically half a year contract left and will be a free agent in the summer, according to few Spanish media his agent has already been contacted about the possibility of returning to Valencia CF and supposedly Andres Palop would be happy to return. He has supposedly been offered a one year contract with the possibility to extend it one year. Valencia CF is likely to sell Diego Alves in the summer, as we've learned from Manuel Llorente few days ago he said Guaita would stay for many, many years and I've reported it for months now that Llorente is under pressure to have more Spanish players in the squad, more Valencianista and he is working towards that goal. So I'd expect Valencia CF to sell Diego Alves, there are many clubs that would like to secure his services and his transfer fee can easily reach 14 million euros. Andres Palop would be the perfect replacement as he is a Valencianista and at the end of his career, so its not a problem for him to sit on the bench, while helping Guaita and sharing his experience with him, who will also be able to deputize when needed as he is a great goalkeeper. So its a strong possibility that we may see Andres Palop back at Valencia CF and it will all depend on the contract negotiations as its likely that few more La Liga clubs would like to get Palop in their teams.